And Emma Frost, who is another character entirely and completely unrelated to the Grey family AFAIK, is also treated here as a usurper to Jean's "rightful" place. 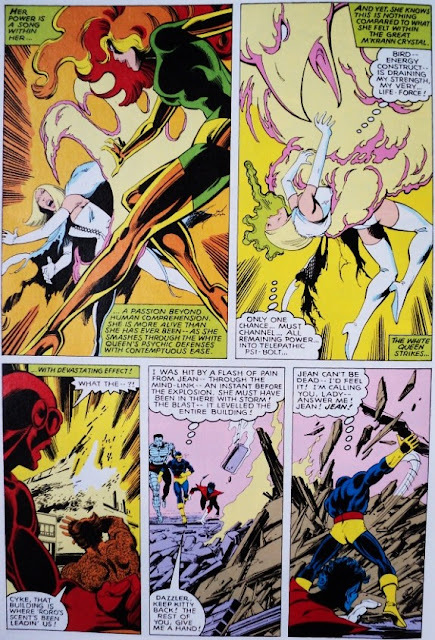 Interestingly enough, when she was bad, Emma Frost was as much Charles Xavier's opposite number (not only as a telepath but also as a professor and as the leader of the Hellions, the "evil New Mutants") as she was the archenemy of Jean. I would not describe Emma as Jean's archenemy, leastways not before Grant Morrison started his dumb Jean-Scott-Emma triangle, and then basically only to fight over Cyke. During the Dark Phoenix Saga Emma just one of the group that targeted Phoenix in an operation, er, masterminded by Mastermind. After Jean's return and during the 1990s there wasn't really much scope for conflict as Emma stopped being a villain shortly after Fitzroy killed the Hellions and soon became a part of the wider X-Men family (as headmistress and teacher of Generation X). 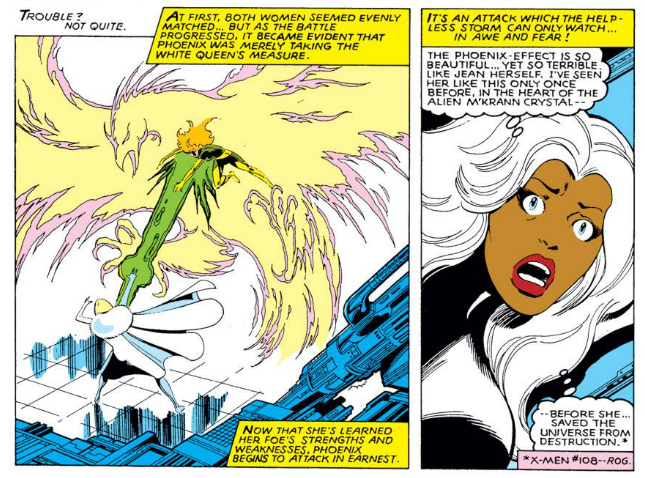 Also, because Professor X was off in space a bit during the 1980s Emma was also sometimes Storm's (re. Kitty) and Magneto's (re. the New Mutants) organisational opposite number, while the X-Men also had other telepaths and mutants with other psychic powers (Rachel, Psylock, Karma, Dani Moonstar), so the matter of power equivalency was a bit more complex. I was thinking about this battle. Dark Phoenix humiliated the White Queen like no one else did before. Since then, they should have been deadly enemies.